Dante Autullo could hardly believe it when doctors showed him the X-Ray of his skull. 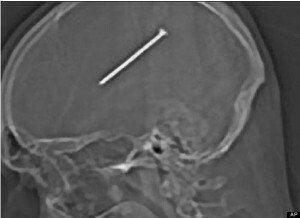 There, just a few millimeters shy of the part of the brain controlling motor function, was a 3 1/14 inch nail embedded in his brain matter. Autullo was undergoing treatment at Advocate Christ Medical Center (which I initially misread as Antichrist Medical Center for some reason which made it seem so much cooler on first pass) when he decided to upload the X-Ray to his Facebook. Because hey, why not? Autullo at first didn’t even think he was injured. When his nail gun shot off a stray round while he was working in his shed he figured it had maybe cut his scalp a bit. He cleaned the wound with some peroxide and went outside to shovel some snow. It wasn’t until later when he woke up from a nap nauseated that he decided to go see a doctor. How did this happen? While there are pain receptors on the skull itself there are none within the brain itself. That’s why he felt the blow but not the constant presence of the nail itself. And why Hannibal Lecter could totally eat Ray Liotta’s brain in that movie that one time. Autullo is said to be feeling fine and now has a cool patch of steel mesh where his skull used to be. The status of his shed project is unknown at this time.